Quality management system in pharmaceuticals helps to improve the product quality and minimize the risk of product recall. Learn here about quality management system, its objectives and importance in pharmaceuticals. Organizations engaged in the distribution, as well as the storage of materials along with products, should monitor, establish, maintain and implement the aspects of the quality management system that allows the delivery of resources, product and services, and materials with the requisite quality and safety. Quality Management System a set of interacting elements based on procedures, policies, resources, and objectives that are established collectively to guide an organization. Quality Management System takes into account all applicable guidelines and regulations that are designed to maintain its robustness. Some factors are essential in developing a process based Quality Management System in organizations, and they include quality policy, quality risk management, and quality objectives. Pharmaceutical market over the past few years has undergone significant change forcing pharmaceutical corporations to focus on the needs and internal efficiency to continue to compete effectively. 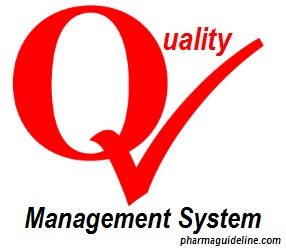 Therefore, Quality Management System supports an active pharmaceutical industry to enhance the quality and availability of medicines around the globe in the interest of public health. Pharmaceutical quality management system demonstrates industry as well as regulatory authorities. Through the regulation of quality management system, organizations facilitate innovation along with continual improvement as well as strengthen the link between pharmaceutical development and manufacturing activities. The areas of continual improvement in pharmaceutical industry include enhancements of the pharmaceutical quality system, identifying and prioritizing the quality of the products as well as consistently fulfilling the quality of drug manufacturers. Quality Management System in the pharmaceutical industry helps to develop an effective monitoring control based on the performance as well as product quality. Further, the system provides assurance of continued suitability as well as the capability of processes that are useful in identifying the monitoring and controlling systems. The system is designed to meet the needs of life science and other regulated companies. Companies globally streamline, automate as well as manage efficiently their processes through the regulation of quality management systems. The pharmaceutical company is ultimately responsible for ensuring processes are in place to assure the control of outsourced activities and quality of purchased activities. Quality Management System stems key regulations for the pharmaceutical industry. It designs a product and its manufacturing process for pharmaceutical organizations to consistently deliver the intended performance as well as meet the needs of healthcare professionals and patients. These approaches transfer product and production process knowledge between development and manufacturing so that to achieve product utilization. Companies establish control strategy that attributes to drug substance and drug product materials that facilitate timely and appropriate corrective action as well as preventive measures. This approach helps the pharmaceutical industries to identify resources of variation affecting process presentation and product quality for possible improvement measures to reduce variation. Additionally, quality management systems provide the tools for measurement in the pharmaceutical industry for analysis as parameters that attribute to the control strategy. A well-defined scheme for process presentation and product superiority assures pharmaceutical industries performance and identifies improvement areas. Monitoring for the duration of scale-up activities can offer a preliminary sign-off process presentation and the thriving integration into manufacturing. Ideally, knowledge obtained at some point in the transfer, and scale-up actions can be valuable in further increasing the control policy. Stability testing of the product in the pharmaceutical industry continues to be executed according to the regulations set by the Quality Management Systems. The changes to the quality management systems in the pharmaceutical industry have evaluated the marketing authorization contributing the appropriate expertise and knowledge from relevant areas. The size of the company determines the level of management and the timely communication to raise related quality issues. Activities in the pharmaceutical industry through the quality management system is systematically planned as well as documented. This help to ensure consistency of performance and provide greater assurance that the ending will be suitable. The overall idea of the quality management system is to support the quality manual and achievement of the short and long-term objectives of the pharmaceutical industry. The procedures help to establish and maintain a clear line of communication to ensure customer requirement is well understood. Subsequently, management reviews in the pharmaceutical industry contributed to determining the stability and the quality of the product. Quality Management Systems assist the design and development process in the pharmaceutical industry to ensure that the resulting product meets the agreed specification. The industry can achieve this by establishing as well as maintaining documented procedures to verify and control the design and development of the product. The plan developed by the quality management systems includes regular meetings to compare design verification and design validation. This can be achieved through stability testing as part of the development phase in the pharmaceutical industry. Through the quality management system, pharmaceutical industry focuses on correcting as well as preventing problems within the sector. It is evident that preventing problems is cheaper as compared to fixing them after they occur. As such the range and the nature of manufacturing by-product, inherent variability in biological products are likely to be variable. The quality management system principles help the pharmaceutical industry in the verification of its activities. This process involves inspection as well as testing at the supplier site before dispatching by the manufacturer. Management control over the quality of customer supplied product should be included in the scope of the manufacturer’s quality system. During these processes, there should be a written as well as the approved contract between the contract giver and the contract acceptor to lay down the responsibilities of each party. Additionally, items provided by the consumer should be without a doubt identifiable. The items should have their quality verified by the inspection and subsequently handled in such a way as to prevent damage. In conclusion, the steps to implementing a quality management systems in the pharmaceutical industry have monitored as well as controlled some parameters to ensure that the process is performing as intended by the process design. It is evident that control parameters will be required to give the necessary level of confidence in the eminence of the end product in the drug industry. Therefore, the involvement of quality management systems in the industry has ensured that equipment is maintained to a standard sufficient capable of performing its intended functions.